Today I want to share a couple of good news with you guys. Let’s first start with the food part! The summer fest was supposedly coming to an end with summer or so did we thought! The idea became so popular among the fellow bloggers that Margaret Roach and her friends who started this fest together thought of having some more fun for a little longer so the summer fest is being extended…and will be renamed to Fall Fest once summer officially ends. This week’s theme ingredient was Garlic. The whole fun about such events is the challenge in it! Although garlic plays a very big and significant role in Indian food but still I wanted to bring something simple to the table that anyone can make. I gave it a lot of thought but then A’s idea sounded brilliant! He suggested that I make Garlic Chicken. Although I don’t really believe he actually wanted to help me and not just have some chicken for dinner, I still liked the idea. Specially because you don’t need to rush to the supermarket or some Indian grocery store to buy ingredients for this recipe. Its pretty straightforward! For this recipe you just need chicken and tons of garlic along with some basic ingredients like lemon and what you have in your spice shelf. So without further ado, let me just come right to the point. Let me tell you how you can make this beauty in you own kitchen. Make a paste of ginger, chili and about 10-12 cloves of garlic. Mix it with yogurt and lemon juice. Add as pinch of salt and marinate the chicken with it. Let the chicken marinate for a couple hours. After the chicken is marinated use a thick bottom skillet or pan for cooking. When the oil is hot enough, add onion. Let it saute until golden. Now add the marinated chicken. If you are using turmeric, add that too. Add salt when the chicken is half cooked. The chicken doesn’t have any gravy and should be done in 20-30 minutes. Serve with rice or your choice of bread or naan. If you think you want to know more about the summer/fall fest click here. Now the second news. Many of you might have heard about DMBLGiT and if you haven’t, let me say in the words of the founder that “it is the grandest foodporn event” on the web! This is a monthly food photography event in which many bloggers participate and then a few winners are announced. And this month yours truly was among the lucky few! Thanks Cooksister for hosting the event and Jaenne and judges for appreciating my work! thank you very much ,great recipe!!!!!! like the subtle flavour,although changed your recipe to my way of cooking. I’ve made this dish so many times! It’s sooooo delicious! It’s definitely one of my favorites, even though my digestion can’t quite handle the garlic or onions well like it used to! Cooked this for mid week dinner. Marinated the chicken over night to get the best flavour, followed the recipe to the letter and was absolutely gutted by the result. This has to be the worst recipe and curry we have ever cooked! It’s hard to put into words how bad it tasted but the after taste we got was a ginger & lemon juice disaster. Once we had tasted the curry we checked the recipe again thinking we had got something wrong but we didn’t. Sorry you did not like the end result. I just made this for tonight’s dinner, it tastes wonderful. Love the photo’s too. I made this for my husband and it was unbelievably delicious! Wonderful! I made this tonight for me and my brother – we loved it. Our cooking time was shorter than the 20-30 minutes noted in the recipe, though. Will definitely be making this again. amazing recipe..prepared this for lunch with coriander mint rice and raita…a perfect combination…loved the subtle flavour of this dish…thanx for posting this easy and tasty recipe…u made my day..
thanks for this awesome recipe!! my only question is how do you make the “paste”? my chicken came out grainy i think cuz of the yogurt? I made a chicken dish before with yogurt and it came out the same a little lumpy and grainy but edible. I have tried this as well and it turned up nicely.Very Nice Dish! WONDERFUL recipe, thank you! 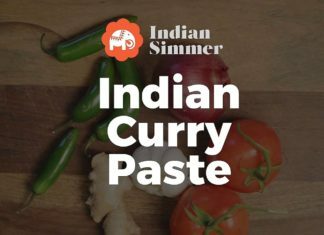 I tried this today with my (Indian) family, and it was a hit – we had it with naan, aloo baigan sabzi and onions soaked in vinegar. I did not have access to a grinder (to grind the green chillies into the marinade) so I just added the green chillies (cut lengthwise) along with the garlic into the oil. Thanks! I made this dish last night and it was absolutely delicious!!!! Thanks so much for sharing it! I grabbed all the ingredients and cooked it at a friend’s house. She literally scraped her bowl clean with her naan bread. It was a big hit! I want to make it again tonight it was so good! oh my! I am so happy to discover your blog! Absolutely stunning! Awesome presentation!! !d first pic is d best!! This looks incredible. I am sucha fan of garlic dishes. But this is just something else. YummY! My parents love garlic, they would highly appreciate this recipe! Love that chicken curry and with si few ingridients too. the pics are amazing….I can imagine how delicious the chicken would be…. Congrats on the award and what a great idea as to Fall Fest. Love love love garlic in all its forms. Congratulations Dear ! Garlic chicken looks heavenly ….. i am in luv with your photography skills. Gorgeous photos. This chicken also looks divine. This looks awesome… I would definitely not think of garlic chicken with indian food. Good JOB! Beautiful in every sense…the food…the photography…well done!! Love this recipe. I’ve gone through your archives and found tandoori chicken and kulfi!! Must try soon. Congrats on winning the DMBLGIT. Of course you deserve it Prema; each picture is beautiful always! Love the chicke, garlic being right up my street! Have to try this soon!! Lovely presentation! You always make your dishes look so gorgeous! Man, how good does *that* look! The recipe looks quite uncomplicated for a dish that looks like it has so many flavors going on. I totally love this. @An open book- pollo al ajillo…huh?? Need the recipe! Congratulations Prerna. As judges mentioned it is a gorgeous prop. Love the simple flavors in Garlic Chicken. the first photo of the garlic is simply surreal!! beautiful! !